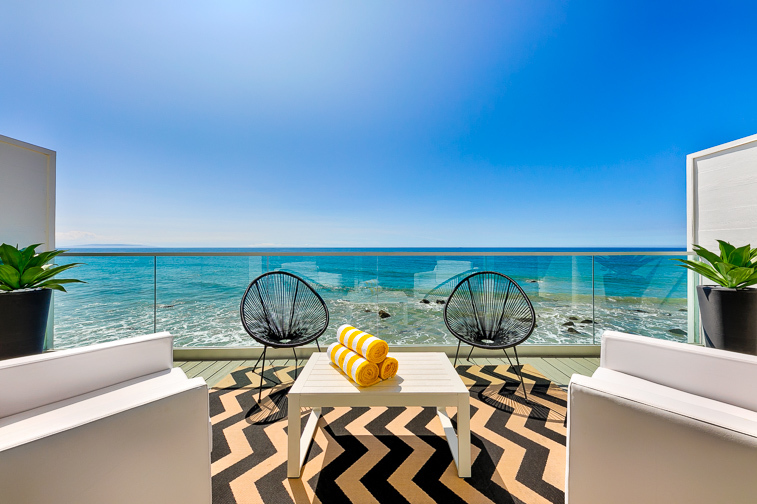 Welcome to Beachfront Bliss - literally right on top of the Pacific Ocean. 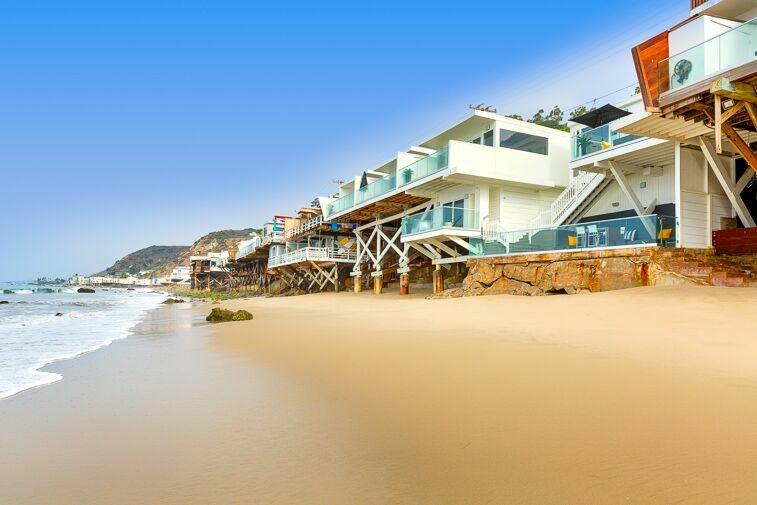 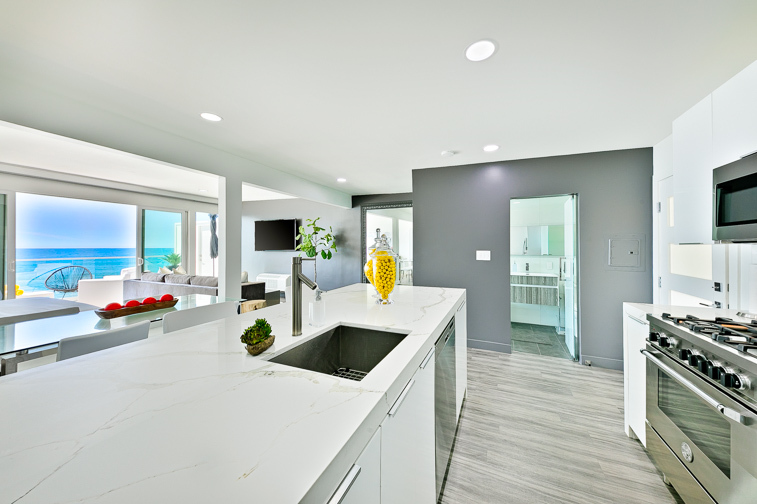 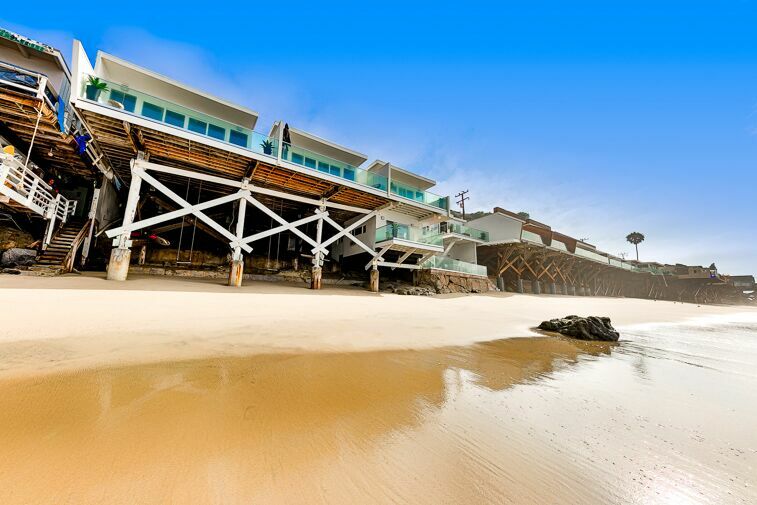 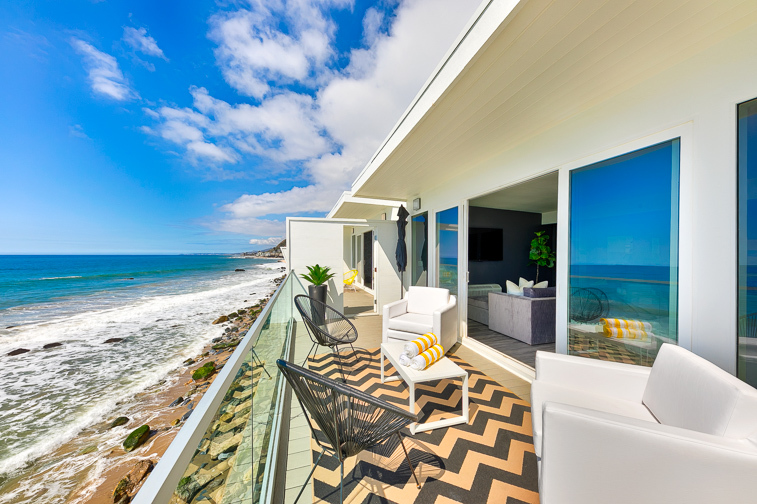 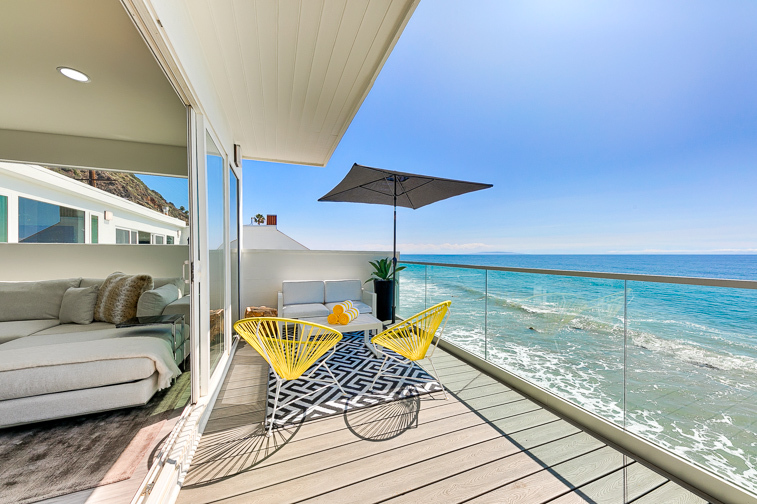 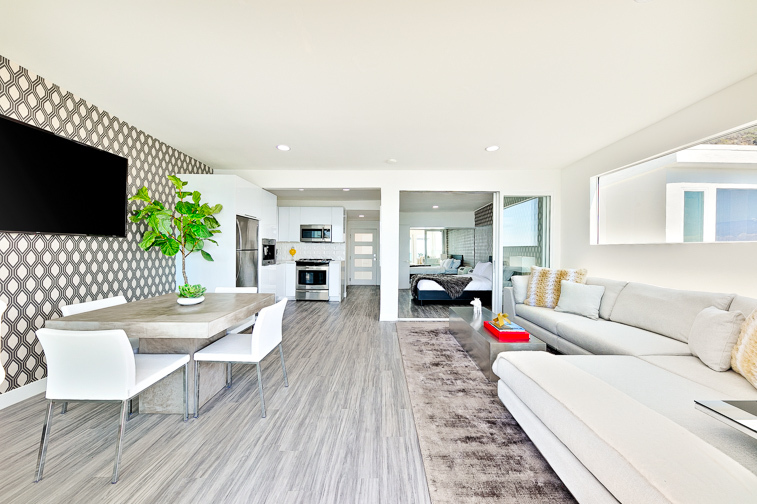 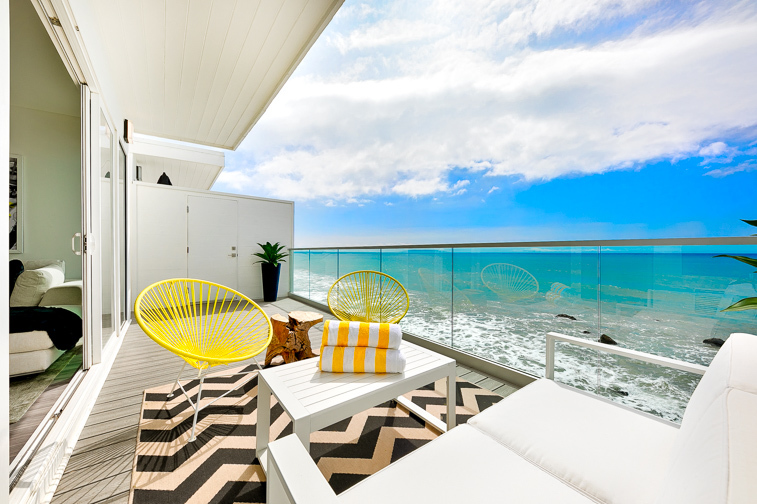 This modern, completely updated, beach chic complex, right on legendary Malibu Beach, is a rare opportunity for up to 12 of your family members and/or or friends to be together for a dream seaside vacation – and still have their own private space. 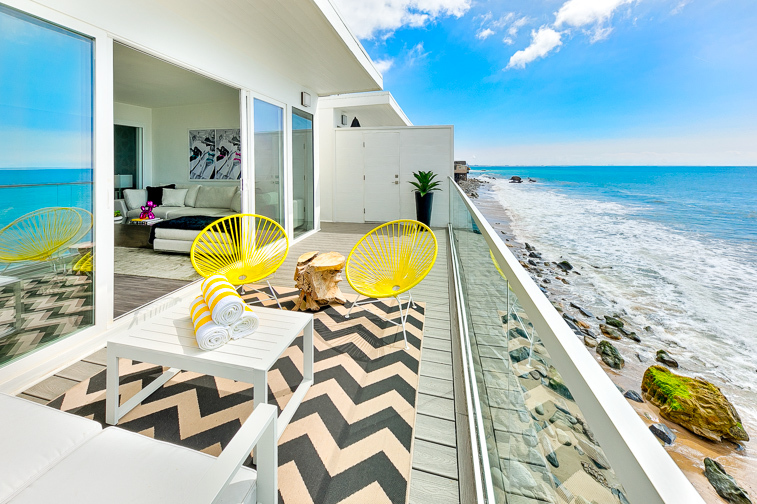 A beautiful shared ocean view balcony with a barbecue and a table with high top stools is a perfect place to gather to enjoy morning coffee, an evening libation together, or even to have a meal together. 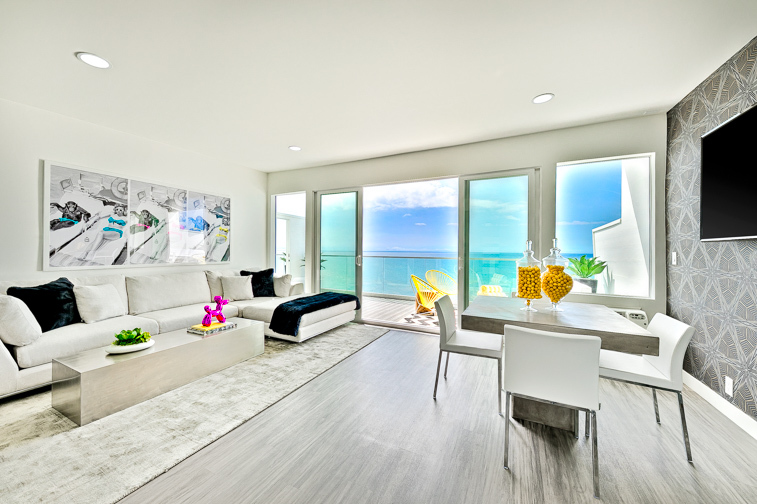 Also, these condos share their private balconies by just opening a door on the outside wall. 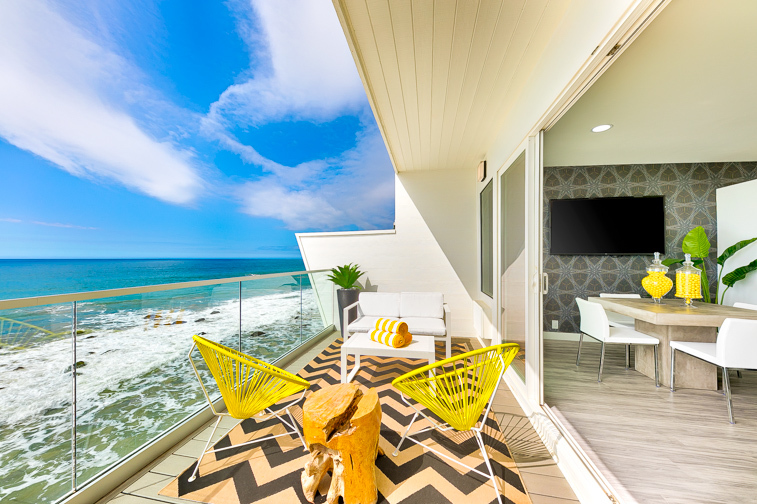 Since all individual condos face the west they are all amazing places to watch the ever-changing colors of a western sunset over the ocean. 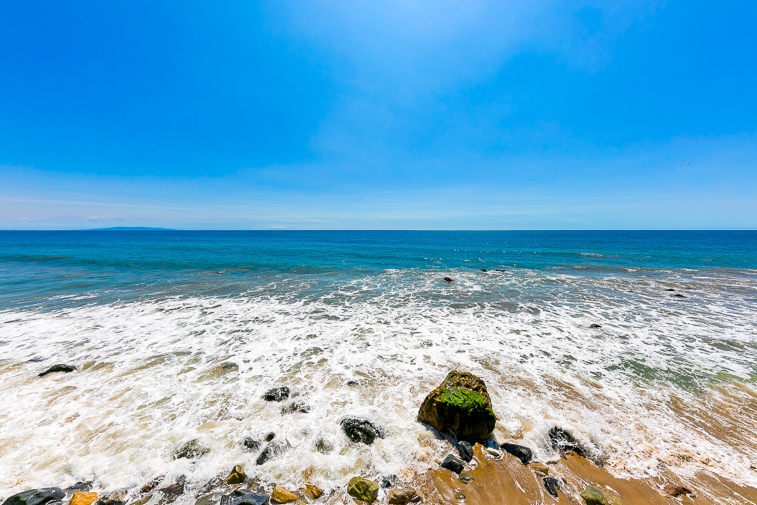 No matter the configuration of the gatherings – large or small - the soft sounds of the surf, the proximity of the sand just steps away, and the coastal breezes will quickly encourage you to relax into your vacation interlude. 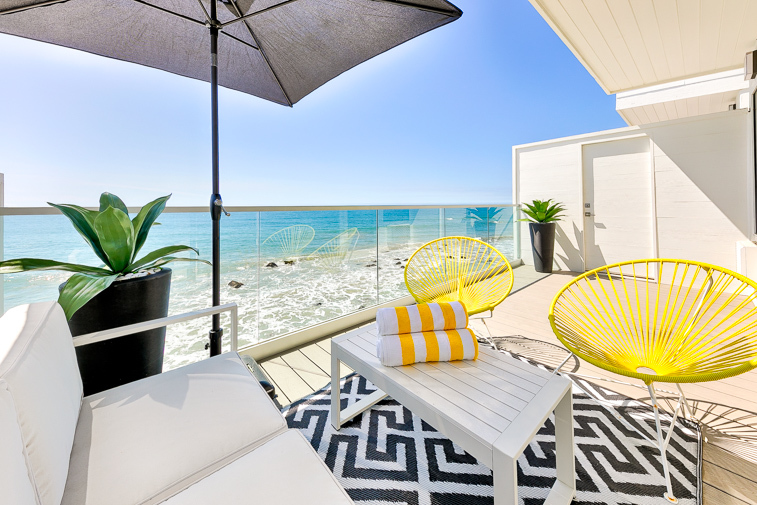 If getting a tan is important, a private balcony, the shared balcony, and the beach are great options. 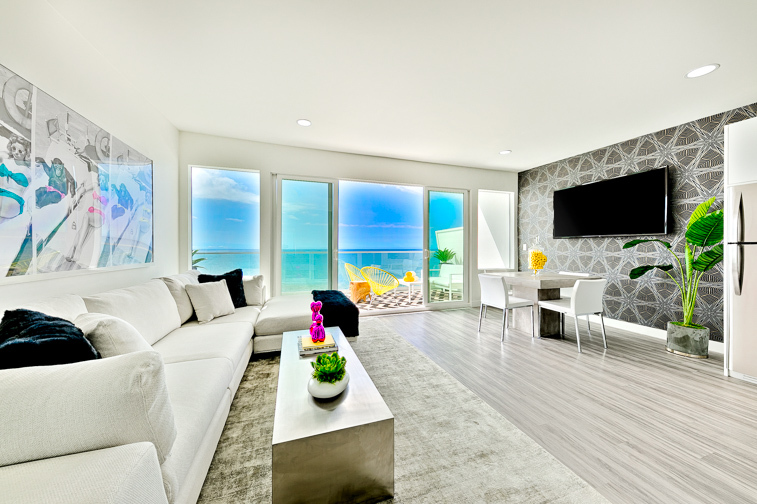 The perfectly crafted and decorated interiors offer generous expanses of scale in its proportions and extraordinary details with beach inspired décor and furnishings - while still feeling inviting, warm, and comfortable. 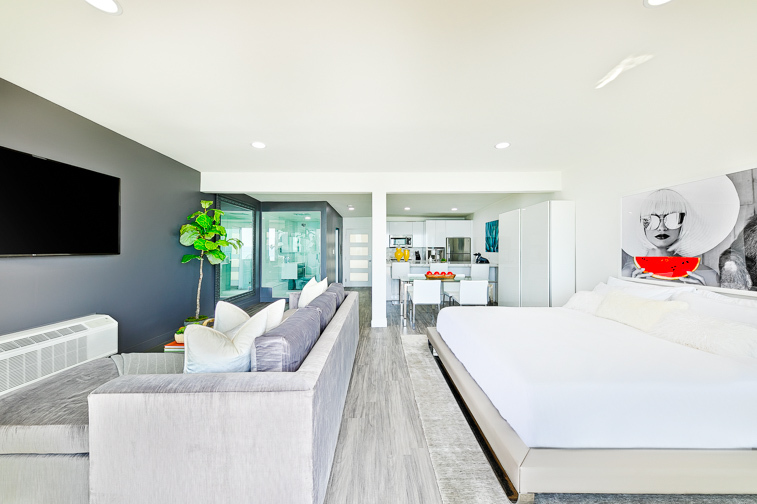 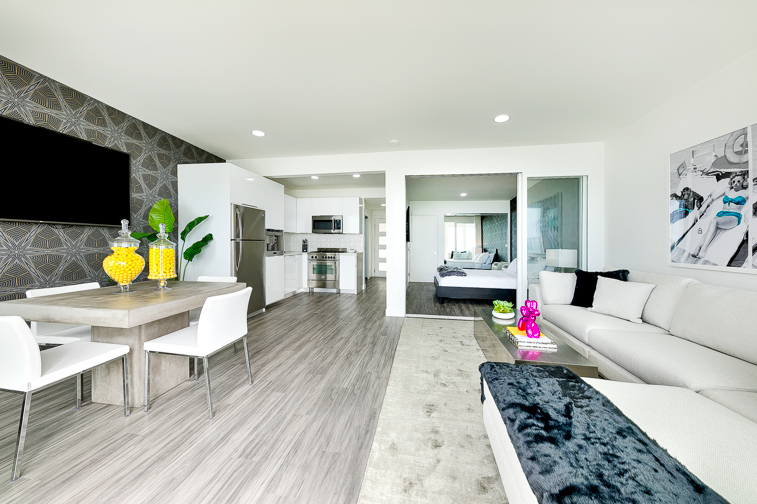 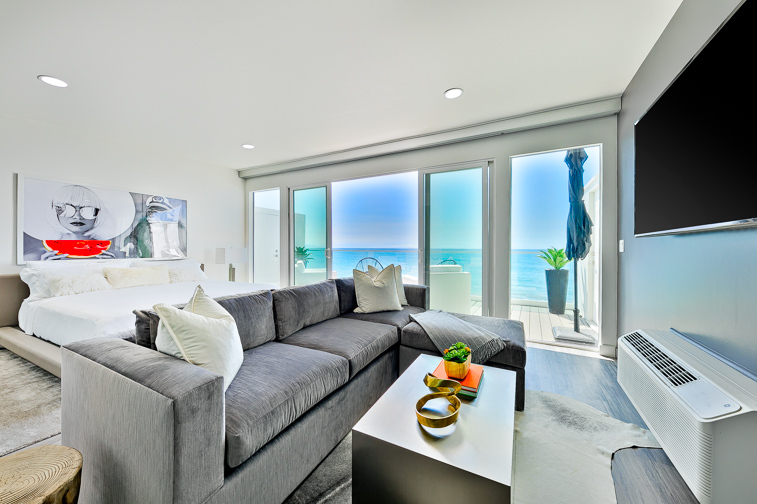 These beach chic studio homes look out at endless panoramic views of the sparkling Pacific, as the glass walls of each great room opens up to private (or shared) oceanfront balconies, making inside/outside living a breeze. 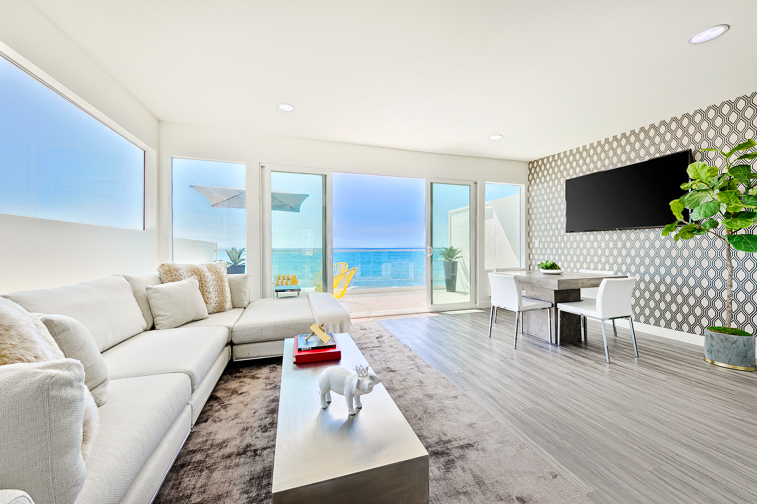 Comfortable cluster seating and a large flat-screen TV in each studio creates a more private space for napping, reading, game playing, or watching TV (and the ocean view) at the same time. 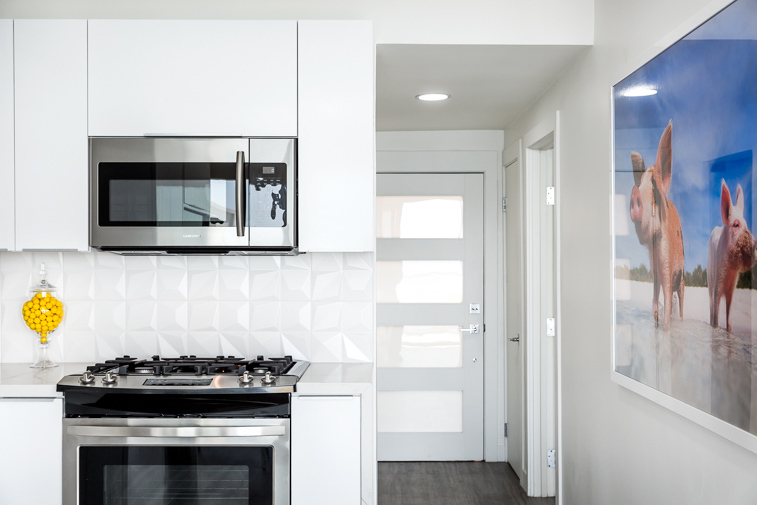 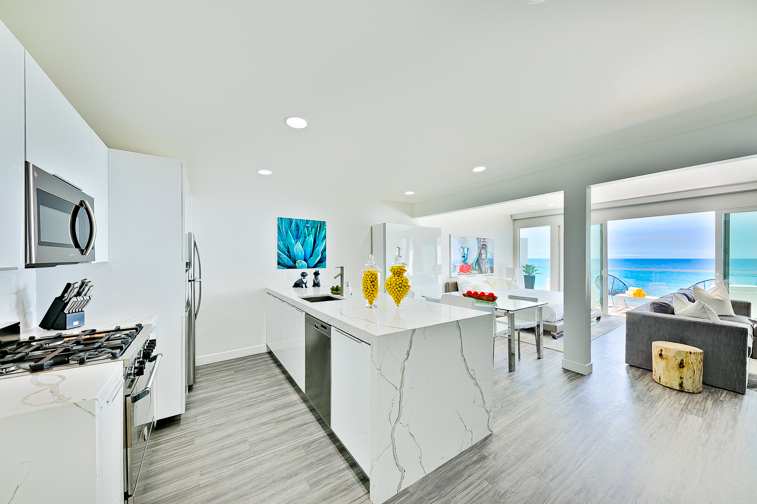 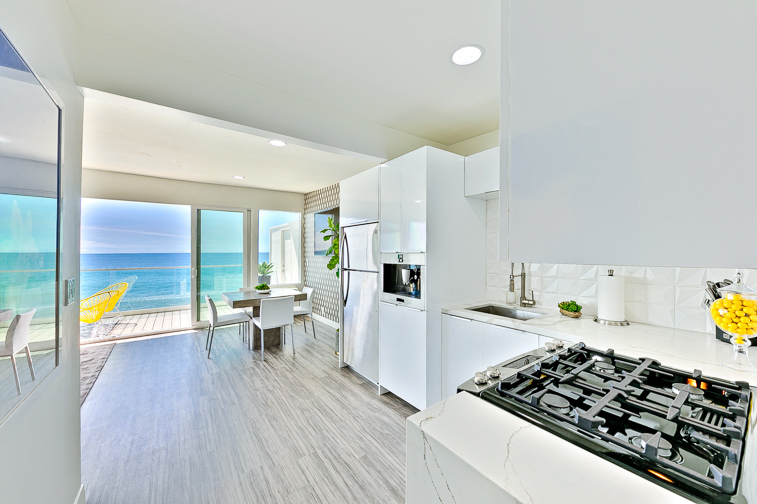 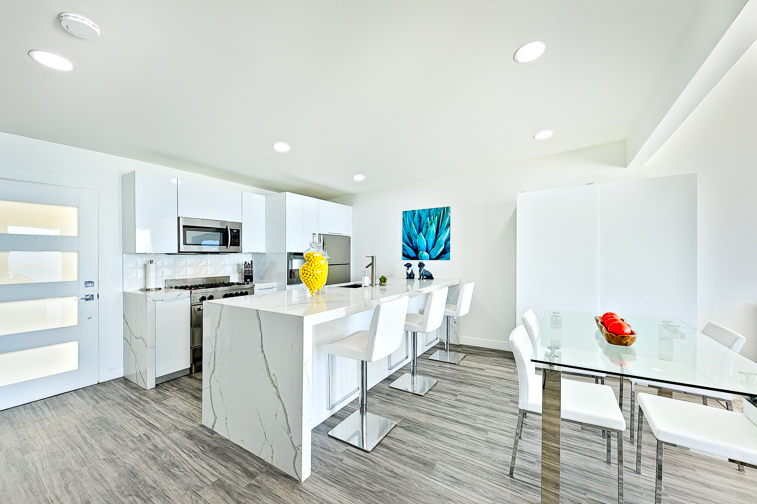 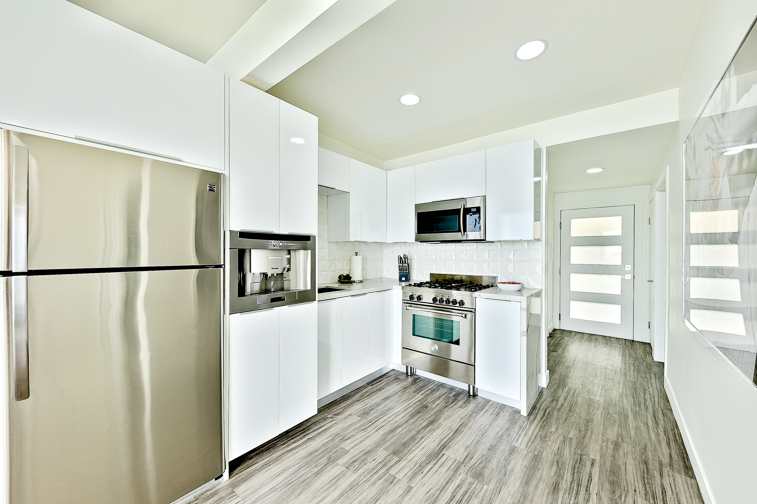 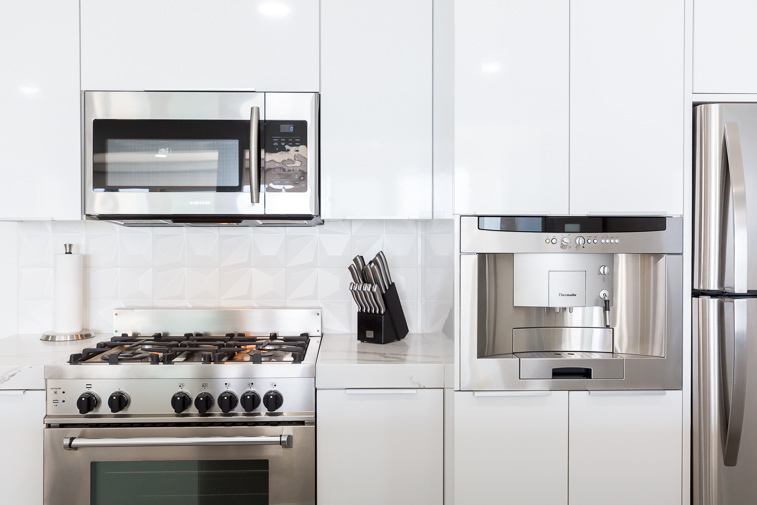 Totally modern ocean view kitchens features new stainless steel appliances and new counter tops. 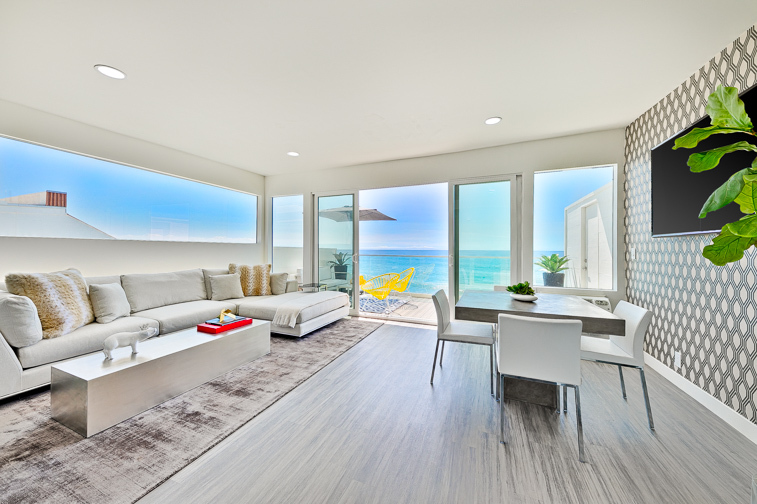 Various dining area configurations for 4 take advantage of the view and the mild climate of this coastal retreat. 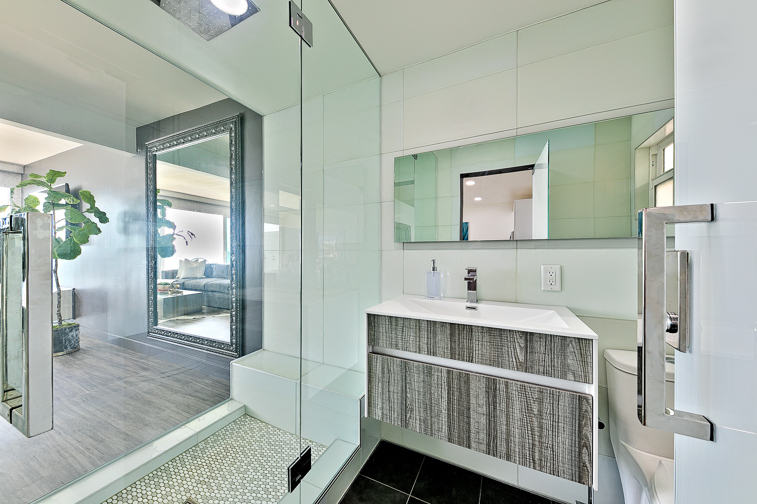 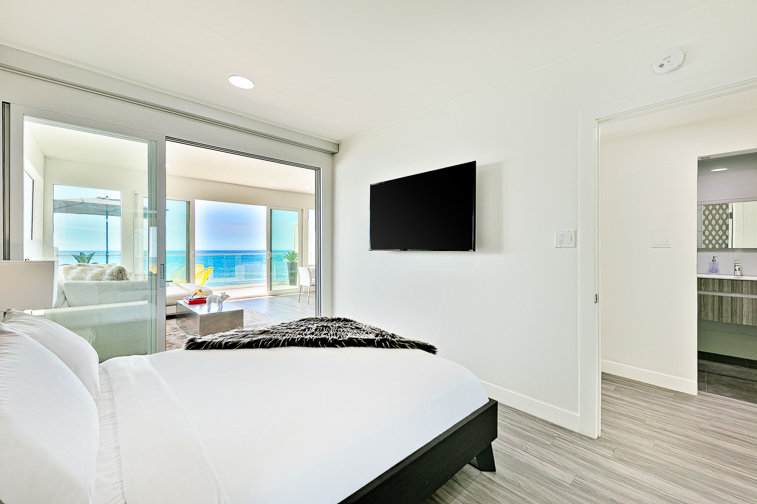 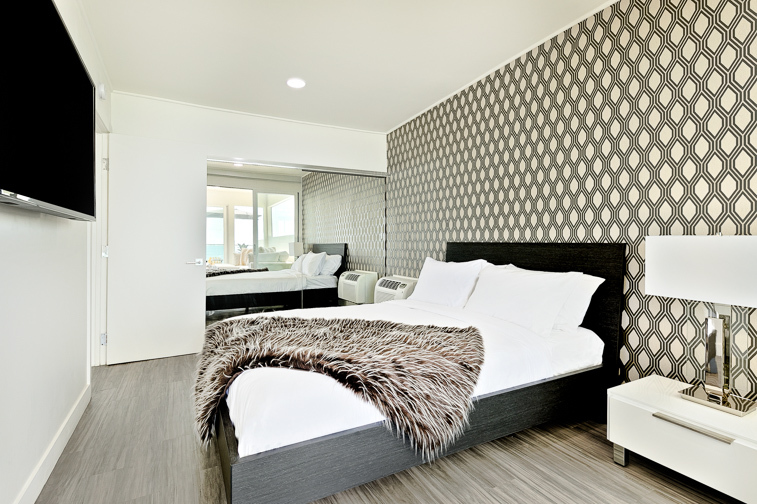 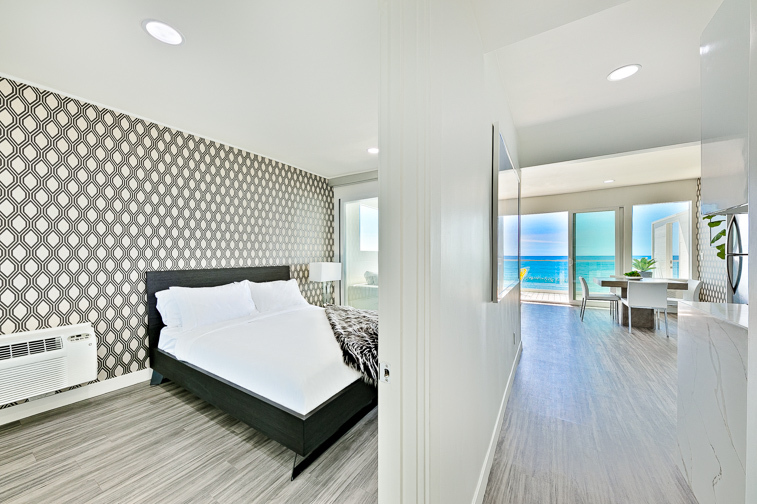 Each unit features either a King or Queen bed with an ocean view, and each also has a beautiful modern bathroom with a large walk-in shower. 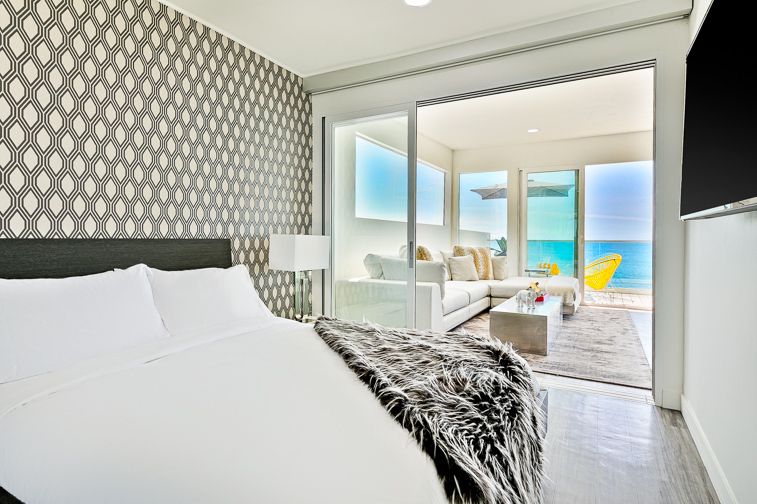 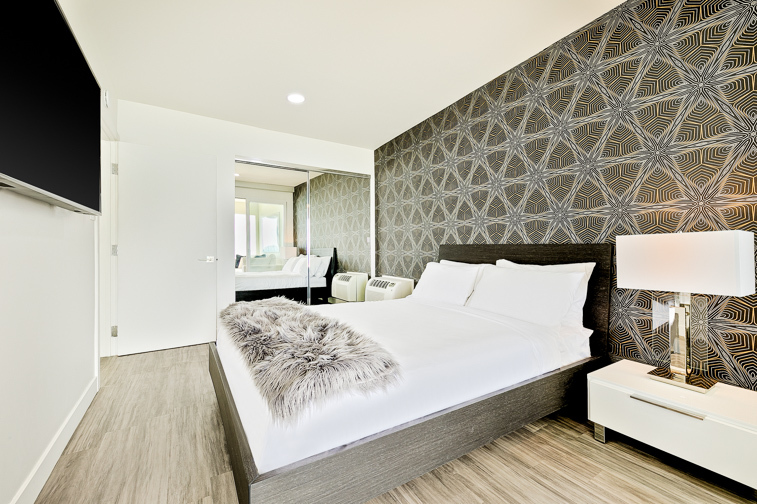 And all bed and bathrooms are furnished with ample premiere linens for your ultimate comfort. 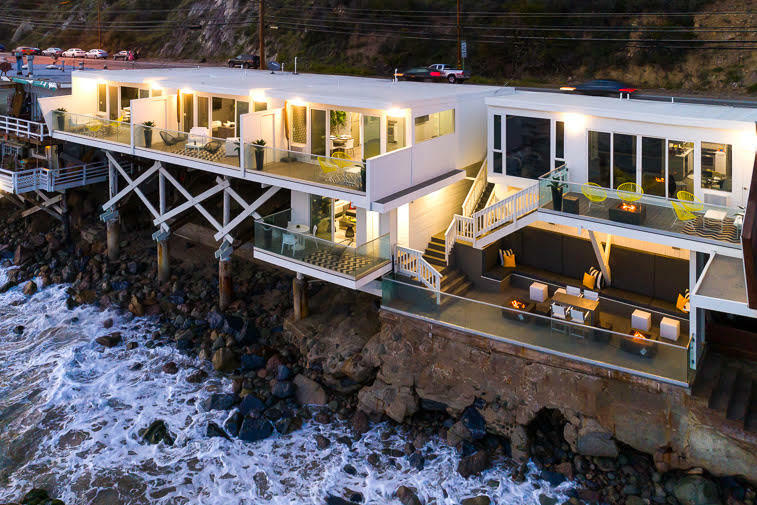 This complex sleeps 6 in beds. 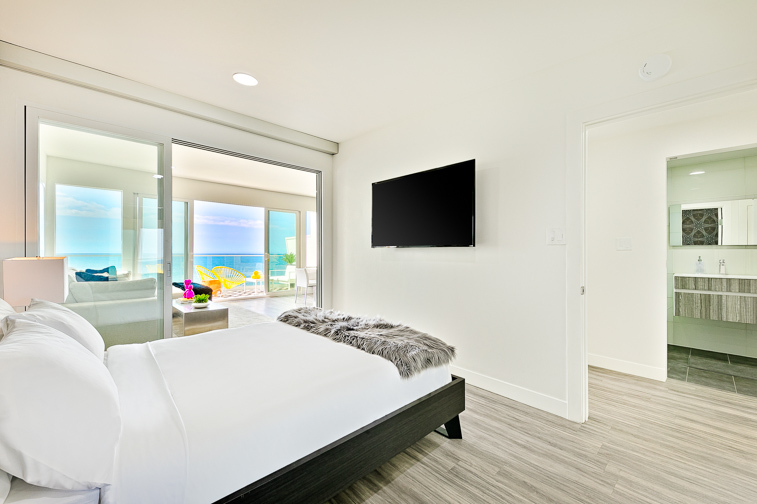 Additional amenities include cable and WIFI. 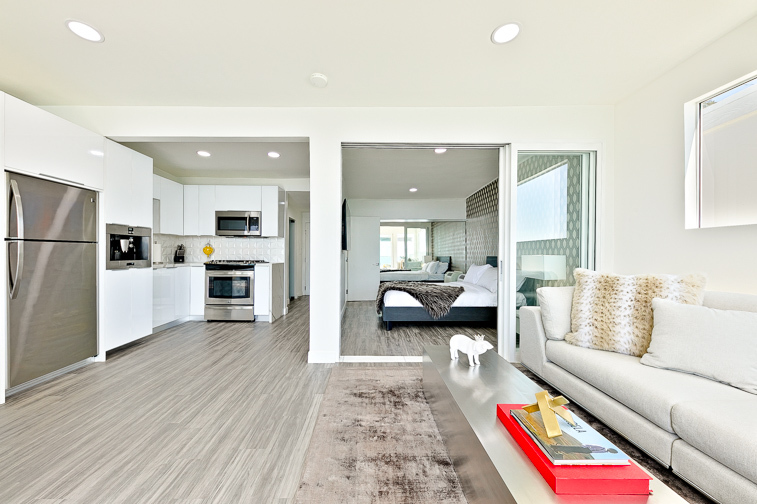 Air conditioning and 1 uncovered dedicated parking space for each unit. 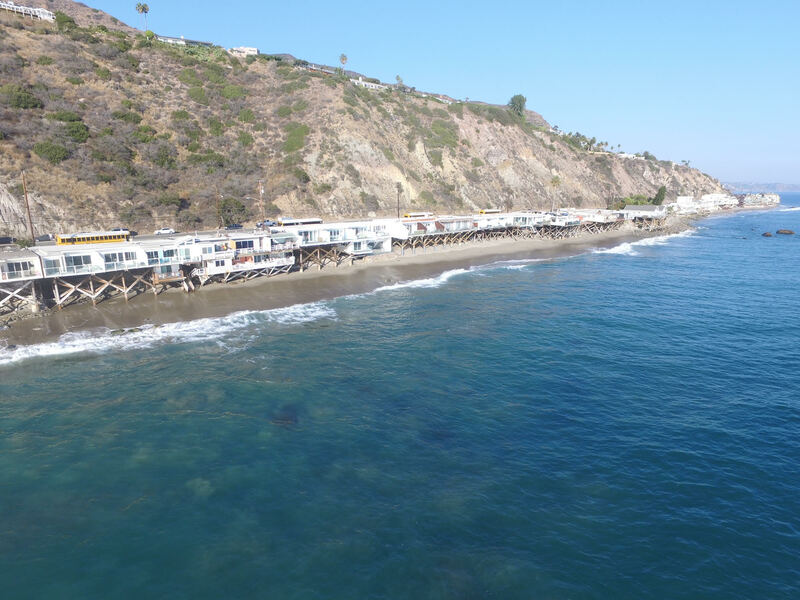 This ideal location is convenient to shopping and within walking distance to the famous “Moonshadows” – a tiki themed restaurant with a patio perched over the Pacific - with a New American menu and handcrafted drinks. 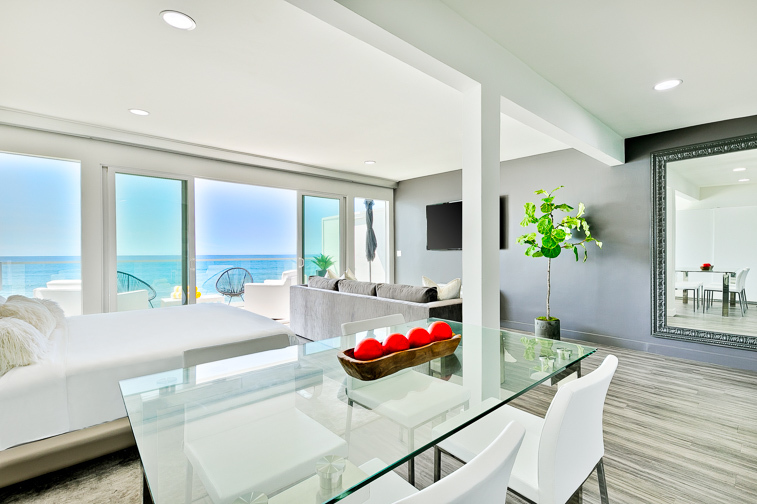 It is also just a 5-minute drive to Santa Monica for shopping and additional restaurant options. 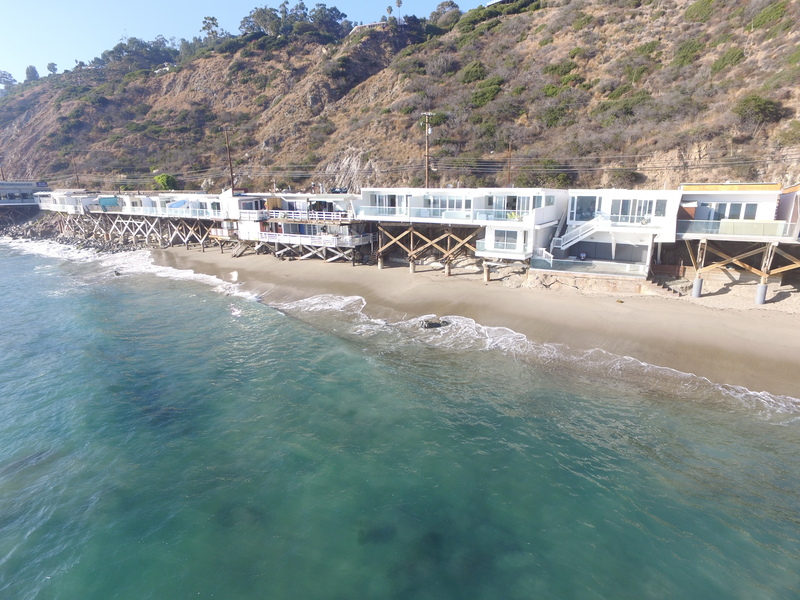 Come enjoy this beautiful slice of paradise on famous Malibu Beach with mild weather most of the year and all the delights, surprises, and beauty of the California coastline. 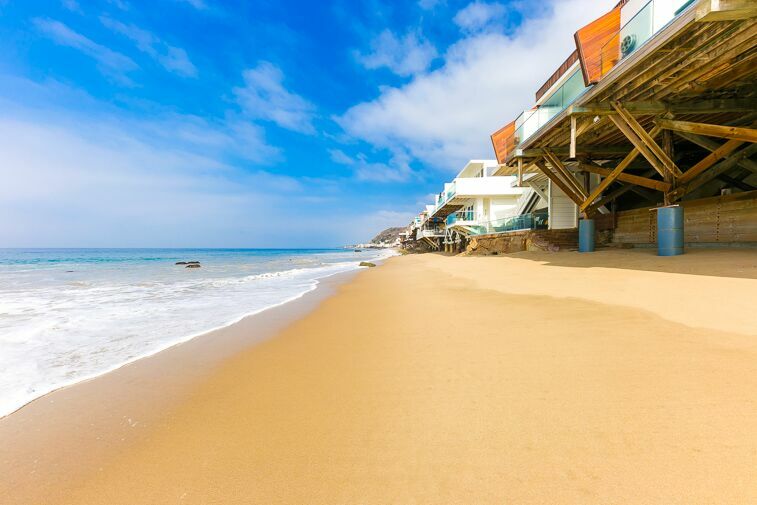 Create beautiful memories of your vacation interlude in this “just right” charming beach haven for a large crowd. 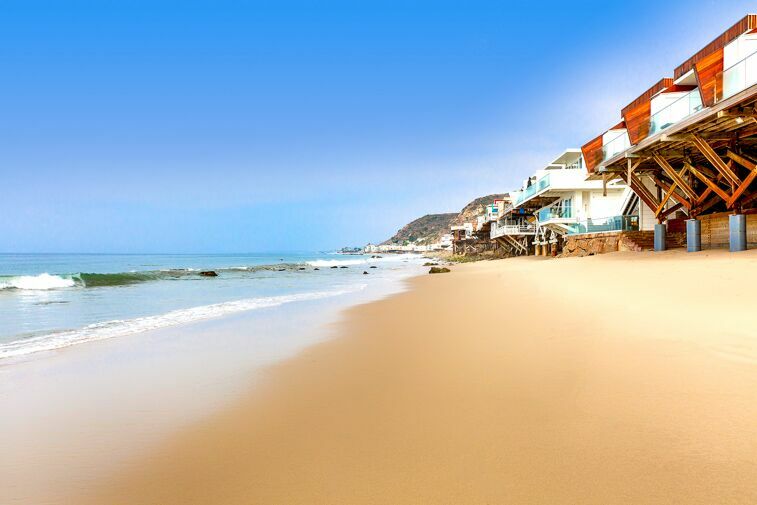 You will want to return again and again. 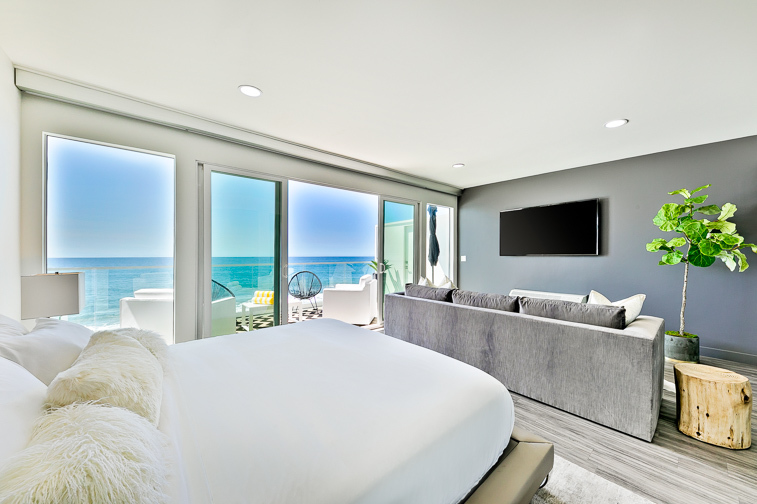 It is right on the beach, with a variety of places to enjoy the endless views of the Pacific – from every room inside to various oceanfront balconies, or the beach, on the outside. 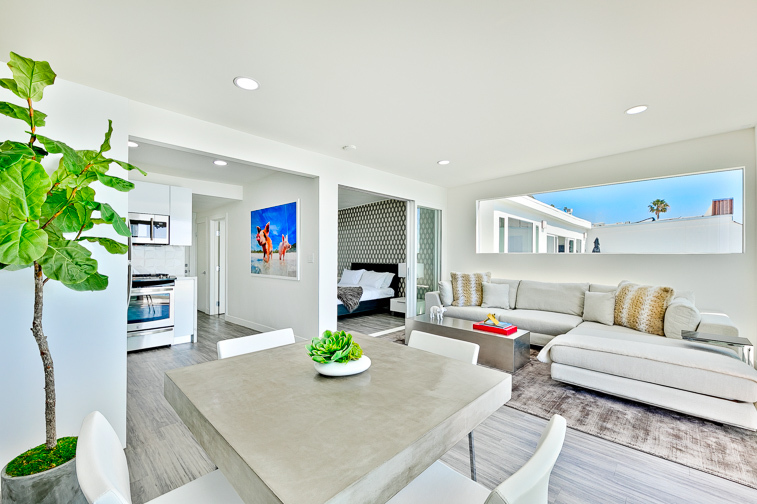 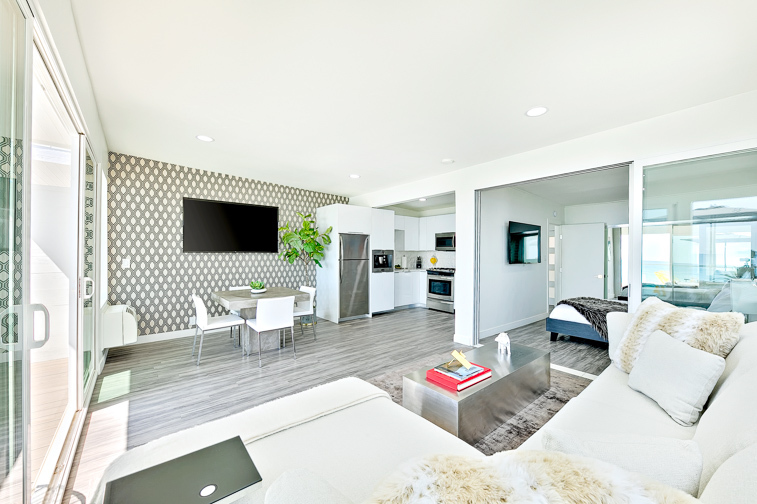 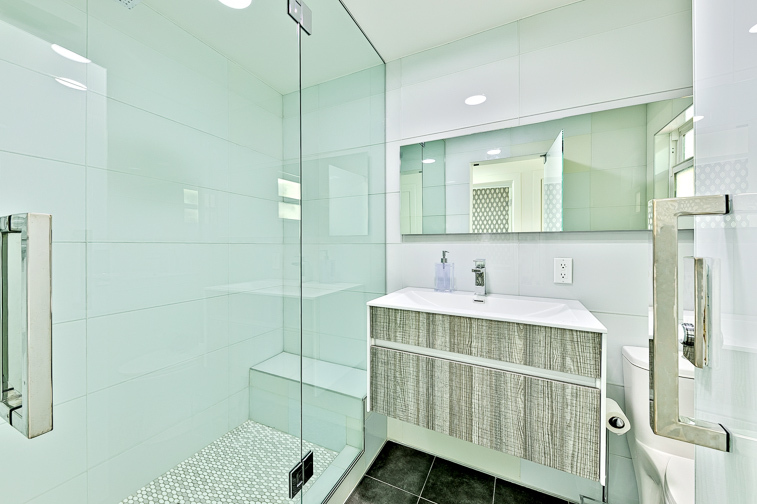 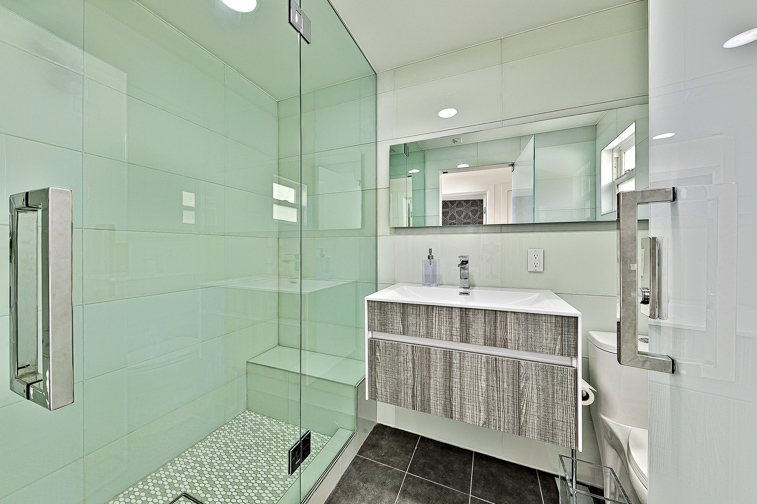 It is only a 5-10 minute drive to Santa Monica – so you are close to shopping and the other amenities the city offers. 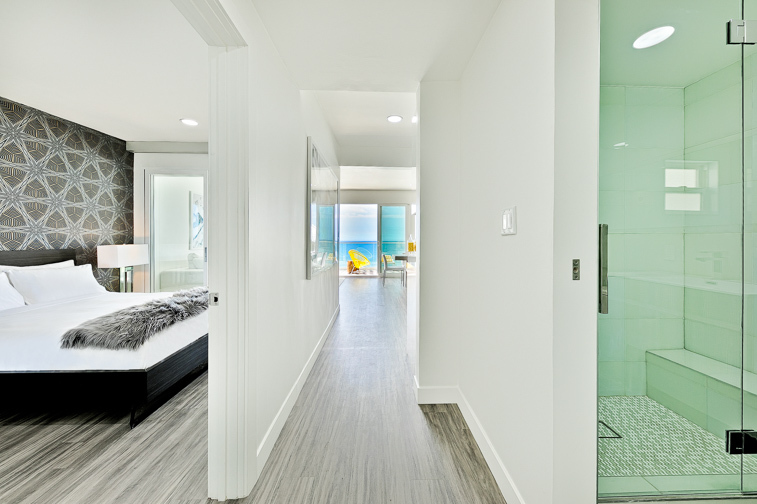 No smoking is allowed inside or outside any of our properties – NO EXCEPTIONS! 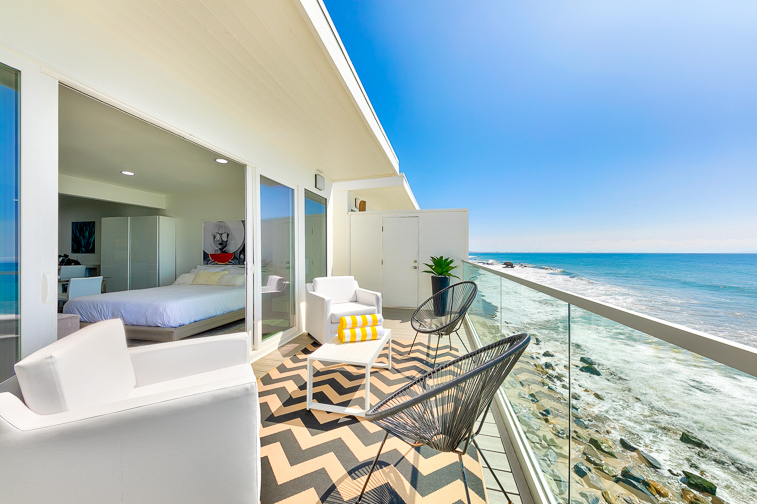 One needs to be able to navigate stairs to the beach and to the shared balcony, so this option may not be appropriate for everyone. 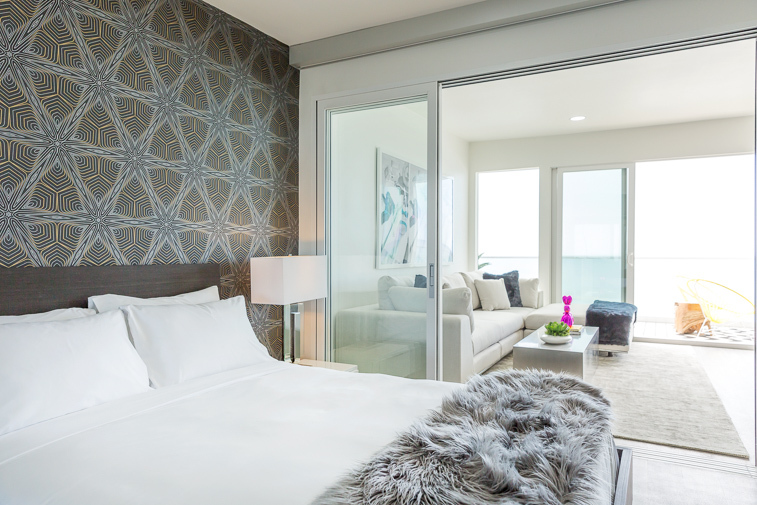 There may be an extra charge for air conditioning, so please check with our Reservations Team for details.